On First Avenue Monday, looking west. As you can see in this video, the downtown segment of Albany’s First Avenue now has new nighttime lighting. Strings of what look like Christmas tree lights have been wound around the trunks of the street trees there and strung partway into the crowns as well. At dusk Monday, the effect was not quite as dramatic as it likely was when it was fully dark. 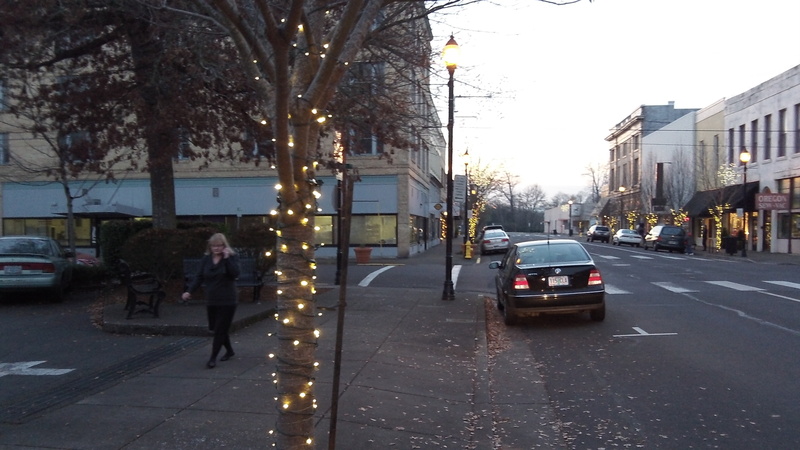 In October the Albany Downtown Association won approval from the advisory board of the Central Albany Revitalization Area to spend $3,750 of CARA funds in the tree lighting. But as it turned out, the downtown group paid for the lights with money it had previously been allocated from the city’s tax on hotel rooms. My wife Tami and I drove home via First Avenue Friday night, and the street looks lovely after dark. It would make for a lovely backdrop for family photos. If we happen to get a snowfall, it will be even more gorgeous.